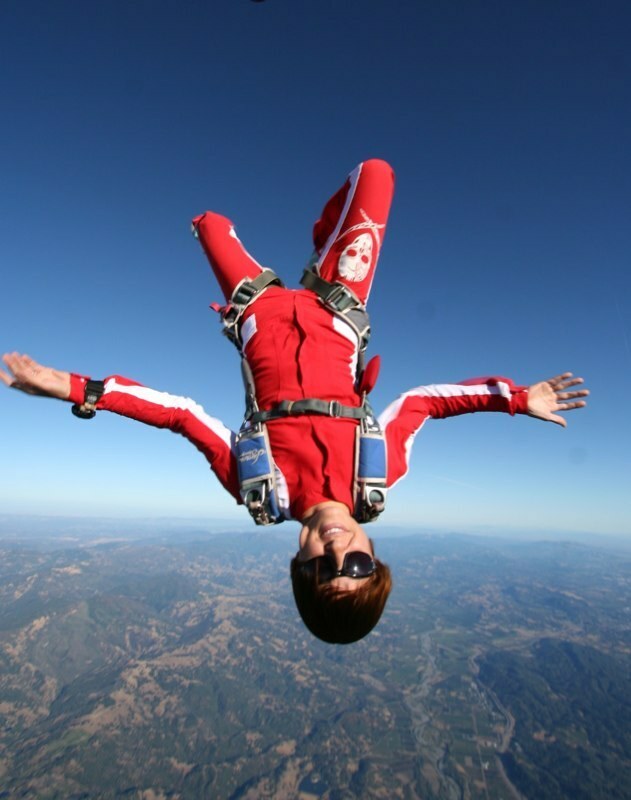 Clair Marie is an exceptionally talented and accomplished professional BASE jumper and skydiver. She is in conversation with Namita Nayyar President Women Fitness. You at the age of 3 first did rock climbing with your father, started skiing at the age 4 and snowboarding by the age of 13, your love of the outdoors and athleticism led you to become one of the youngest BASE jumpers on record at the age of 16 and you later reached the pinnacle of success by establishing yourself as a respected authority in the sport of BASE jumping. Tell us about this fairy tale journey of yours? Growing up I was always encouraged to explore. I was born and raised in a very small mountain town in northern California. There were only 52 people who lived in my town and the nearest “city” was 40 minutes away over a mountain range. I was one of 9 kids, the oldest girl, yet there were no other kids who lived in my little town. The only thing I had was the outdoors to occupy my time. I was homeschooled my entire life which just aided in my ability to spend the majority of my upbringing outside adventuring. Climbing was my number one sport as a kid. I loved being outside and high above the ground, looking down at all the trees and houses that looked like a kids play thing. It always made me feel so different from the world. Separate from the issues and the trivial. I credit my BASE jumping to my deep desire to experience more in life then the average person. By the time I started BASE jumping at 16 I had already graduated from High School (I was a part of a system that legitimized home schooling and monitored education) and was ready to start the next chapter in my life. I had been attending a Community College for almost 2 years and felt ready to venture out into the world as an individual. Immediately after starting BASE jumping I got a job as a parachute packer at a local Dropzone (skydiving center). I packed for a while and eventually became a videographer, filming first time jumpers so they had something to show of their adventure. I continued to BASE jump just as a passion during that time. It wasn’t until later that I shifted my focus towards making a living as a BASE jumper. Although from an outside perspective my journey may come across as a graceful sprint to success, it however has not been. I have had many incredible highs and equally as intense lows. Facing harsh criticism and judgement from the majority of people in and out of the sport yet at the same time some support from people whom I never would have imagined would support me. Regardless of the hard times I look back and see how far I have come and the things that I have accomplished and all the pain and headache has been very worth it! I have had the pleasure of seeing and experiencing so many different locations, cultures and sports. BASE jumping and skydiving are sports of extreme courage and gut. How you have been able to overcome that feeling of fear and hair raising emotion involved in it? In the beginning I tried to ignore the fear, to push it aside and act as if it wasn’t a factor in what I was doing. I tried to convince myself that I didn’t have fear, that I was above it. However I quickly realized that fear is a very important part of what I do. Fear is what keeps us alive. It can also be what limits us if we allow it to. There is a normal amount of fear that I need to recognize and respect. Fear makes me pay close attention to detail, but I don’t let that fear dictate or control my experiences. I think fear is massively misinterpreted in the world today. Fear is used as a limiting factor, a reason not to do something. At the end of the day I believe that most fear is irrational and stems from an in-education, Once you get past that aspect of fear the only thing that is left is a logical representation of what the possible outcomes can be which provides a base for me to evaluate what I am doing on a jump by jump basis. Every jump I make I am presented with the option to make the right choices for me. I get to choose if the weather is with in my comfortability level, if the object is in line with my ability level and if I generally feel good about the jump. There have been several times where all of those didn’t line up and because of that I chose to walk down and not jump. Accepting the emotion that I experience but not allowing it to limit me is something that I work on every day, Some days it is easier than others but at the end of the day it is worth it! You are a BASE jumper, skydiver, AFF instructor, model, stunt woman and a tv celebrity. How you manage such a remarkable multi-dimensional lifestyle? Life for me is always about balance and not getting too far ahead of myself. I, unfortunately have a tendency to think too far in the future some times and the result is me getting stressed out and overwhelmed. I have been fortunate enough to see this in me and when I start to do that, force myself to be more in the moment and focus at the task at hand. I believe that is the only reason I have been able to have such diversity in my life and my sports. Looking back 10 years ago if I would have been told that I would do all that I have I never would have believed it. But looking at each individual task as its own thing I have been able to accomplish much more then I ever thought I would. Now that I have each one of these traits and abilities in my arsenal it is easy for me to pick and choose which ones to dive into for projects, sometimes mixing them up to create fun once in a life time stunts like my modeling and BASE jumping. The key for me is to have fun. When I am having fun I accomplish so much more and the outcome is usually much better than anticipated. Elaborate about your endeavour of being a AFF instructor and teaching students your skills at the age of 19 years? I always loved teaching. From a young age I realized there weren’t a lot of people who did what I did and if I wanted to socialize and have friends but still do what I loved I would have to teach them. For me I feel very fortunate to do what I do, jump out of planes and off cliffs. I can look back at the way I was taught, how hard it was for me to find instruction and how frowned upon I was for what I was doing. It was not an easy time, so I wanted to do my best to eliminate that factor for those who wanted to learn. The fact that I was young was never a big discussion in me becoming certified as an instructor as my ability spoke for itself. The biggest thing I knew was I want to have an active roll in introducing others to the wonderful sports that have changed and shaped my life over the years. The sports that have provided so much happiness and laughter to last 10 lifetimes. These sports changed my life and the way that I view it. I wanted to give that back to others so they too can understand why I do what I do and give them the opportunity to experience something that could potentially change their lives as well!